If you're spending thousands of dollars on a fancy induction cooktop, you might as well spend a little more to tack on some smart sous vide capabilities. That's the thinking at GE, which has announced the first sous-vide device that integrates with a cooktop. The $149 accessory uses a temperature probe and Bluetooth transmitter to communicate directly with the cooktop, ensuring a consistent temperature during the hours-long sous-vide process. Users can dial in the temperature directly on the cooktop, but GE is also working on a companion smartphone app that connects to the sous vide setup via Bluetooth. 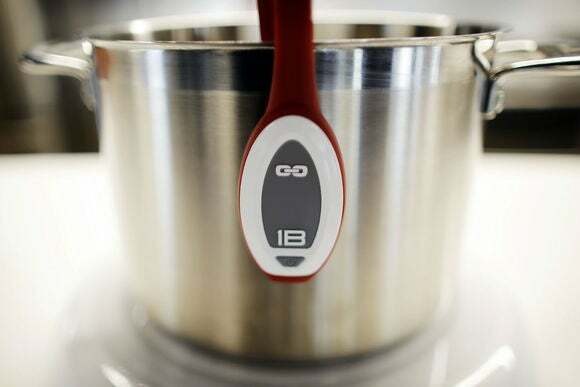 This would allow users to control and monitor the cooking process remotely. Sous vide involves vacuum-sealing the food—usually meat—and cooking it at low temperatures for a half day or longer. It's become a popular cooking method in restaurants for its ability to create tender meat under highly controlled conditions, though it's starting to show up in home kitchens as well. GE's competition includes much cheaper alternatives like Anova's $179 Precision Cooker, which uses electric power to heat the water in any pot and on any surface. Other options include the $199 Nomiku and the $400 Mellow. GE's cooktops and sous-vide accessory will launch in May. Why this matters: GE's setup is considerably more expensive due to the price of its cooktops, which start at $1,599 and scale up to $3,099. Still, it's the only one that doesn't need to be plugged into an external power source. And because the induction cooktop only heats the part of the pot that comes in contact with the surface, it's a lot safer than trying to heat something on the stove for a day or two on end. Maybe that's the difference between using the thing regularly and letting it gather dust next to your bread maker.